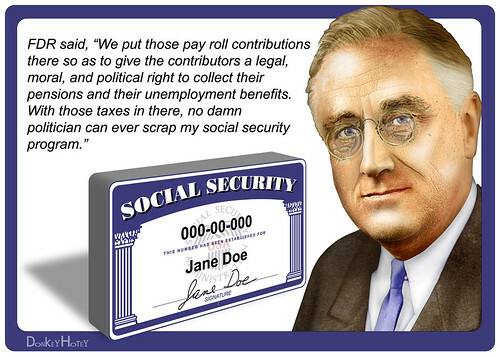 Well, it looks like there is a new push on in the long term destruction of Social Security today. Now, I usually write about the plight of the long term unemployed and underemployed but I am getting close to Social Security eligibility so decided I would discuss the anti Social Security effort today. To achieve a fiscal compromise, Obama agreed in 2011 negotiations with House Speaker John Boehner to changes in Social Security that would be anathema to liberals, but Boehner walked away from the talks. Both histories are factually correct. That coherent accounts can be written either way ought to suggest to partisans that neither version is quite the slam-dunk they imagine. At a minimum, it ought to propel the White House to continue acting in the national interest, whichever party that seems to serve. And for a long time, Obama has said the national interest requires both revenue increases and reform of entitlement programs. Once again, Mr Hiatt and the Post are pushing the myth that Social Security is a part of the overall Federal Budget and needs to be “controlled” to “fix the deficit” when in fact, Social Security loans to the Genera Fund have been propping up the Federal Budget for decades, allowing for the tax cuts over the years. While I expect this type of nonsense from the Washington Post, today’s Tampa Bay Times had a decidedly misleading headline (“US spends far more on seniors than on kids.”) How is it misleading? In 2008, all government (local state, and federal) spent $26,255 on average for each person 65 or older, most of which is Social Security and Medicare. Conversely, the federal government spends relatively little on children and Medicaid is the largest single item. State and local governments spend much more on children because they pay for schools. But overall, governments spend far more than double on seniors than they do on children 18 and younger.